Do you usually walk out of the bathroom after "going" and leave the toilet seat up? What items do you keep near your toilet? There are two really good reasons why you should always close the lid of your toilet seat. 1. 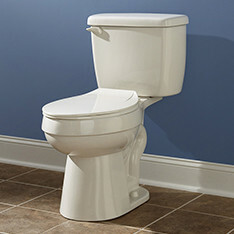 Closing the lid every time will prevent water from evaporating in your toilet. 2. Closing the lid before you flush (especially after #2) can prevent the spread of harmful bacteria in the air. When you flush and you see the water swirl it creates a "toilet plume". A toilet plume happens when the swirling water mixes with small waste particles which then become aerosolized (imagine very small particles of feces escaping the toilet and landing on everything surrounding your toilet). If you are prone to leaving the seat up or are sick of hearing the toilet seat slam when others are closing the lid, then you have to check out these slow close lids. We installed slow close lids on all of our toilets to prevent that annoying toilet slam noise from the kids. All you have to do is gently touch the toilet lid and it slowly closes on its own. Warning --> If you flush with your toilet seat up it would be a good idea to keep your toothbrush covered or as far away from the toilet as possible. The germs and bacteria can fly up from the flushing toilet and find its way to your toothbrush, nothing like brushing your teeth with poop particles...ewww! Oh, great tips on flushing the toilet! Definitely gross when you think about it. We ended up installing slow close toilet lids to prevent the slamming toilet lid noise, making it easier for the kids to close the lids.